Maybe you want pasta? Maybe you want to feel like you’re having pasta without actually having carbs? Maybe you could turn some zucchini into noodles—Call them “zoodles”—then dress your zoodles with a tasty pesto and some juicy, caramelized roasted vegetables? Preheat oven to 420F. Lightly brush asparagus, mushrooms and peppers with olive oil and sea salt, then roast them for 20 minutes, turning them once at half-time. Cut the asparagus in half, then slice the lower half into one-inch lengths. Combine pesto ingredients and blend until smooth. Preheat the oven to 420F. 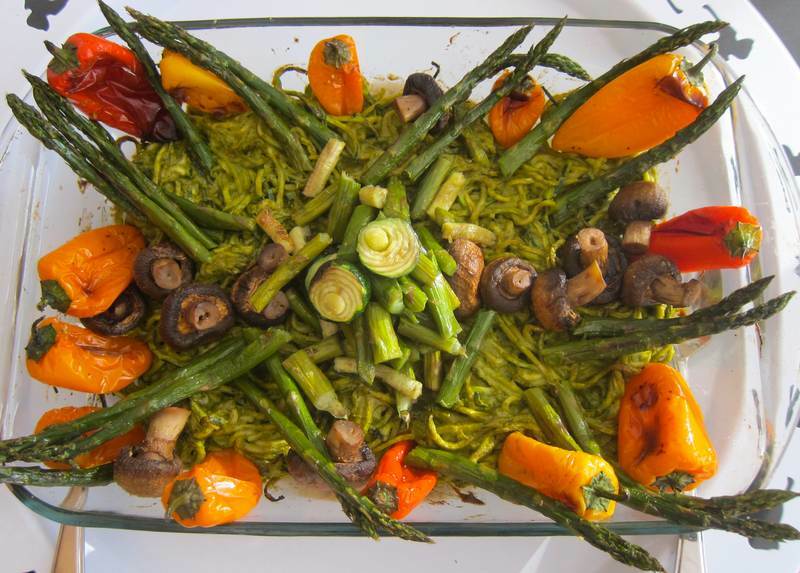 In a casserole dish, dress the zoodles with half to three-quarters of the pesto. Roast for 15 minutes, then serve hot, garnished with roasted vegetables. Serves 4, with extra pesto leftover. It’s been awhile since I licked the blender, utensils and platters clean. Here are the 22 most hipster foods on the planet, and zoodles isn’t one of them. 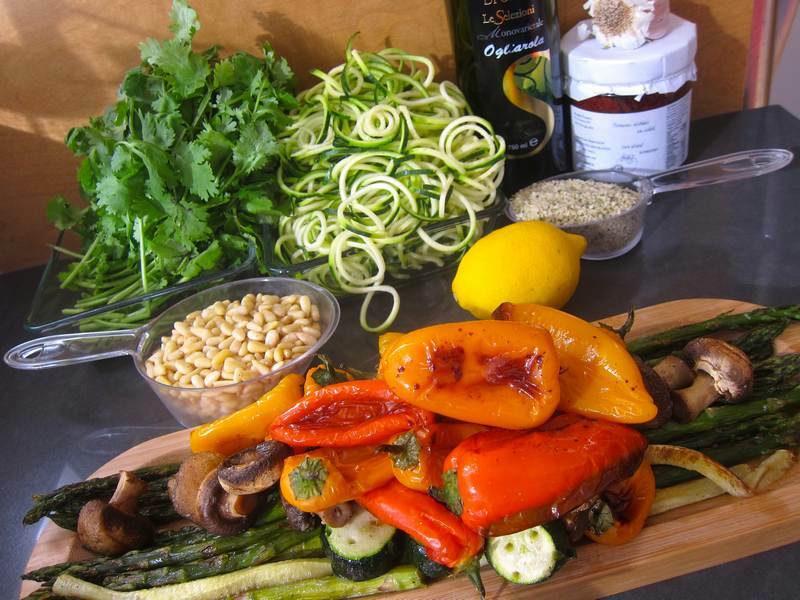 This Zoodles and Roasted Veggies with Pesto is so colourful! Can you name 5 white vegetables that are super healthy? Happy Easter! Here are 25 recipes for a delicious Easter. What product did you use to cut the zuccini. I bought one of the slicing gadgets a few months ago online, it did not work well. My brother gave me a spiralizer. I think it’s made by Paderno, costs around $30 and so far works very well. There are also peeler type gadgets that make julienne strips that are noodle shaped. I bought the same gadget online as anonymous. It produced about 1 inch of noodles and then the zucchini got stuck. I really liked the Hipster article. I’ve always felt the kale and Brussel sprouts didn’t deserve the star treatment they are currently getting. Pesto on the other hand is a star. You can borrow my spiralizer anytime you want to make some noodle shapes. Pesto makes everything taste good. Great vegetable dish. I’m pretty much in love with vegetables. Does it show? I’d like to try the zoodles I love courgette so I’m thinking I’ll love these! Made zoodles again today. Roasted them then tossed them on a pasta dish. It was hard to keep everyone from nibbling them straight off the roasting pan. I bet! anything roasted is amazing…and without the guilt!